I picked up this train table from the goodwill for $20! My husband thought I was crazy since it was a bit banged up and not real wood. I thought it was a great deal considering the $100+ price tag I've seen on new train tables! Plus I knew our kids would love it and with a little bit of work it would be almost like new. First, I cleaned it off all over with a rag and some soap and water. Then I took it all apart. Once it was all laid out I gave it a light sanding where the edges were roughed up. I painted the main parts of the table with white chalk paint. Then I painted the drawers with teal chalkboard paint. Next, for the tops, I used a chalkboard spray paint and the other side with leftover home made teal chalk paint. I left everything to dry and that evening I did a second coat. Then let it all dry overnight. 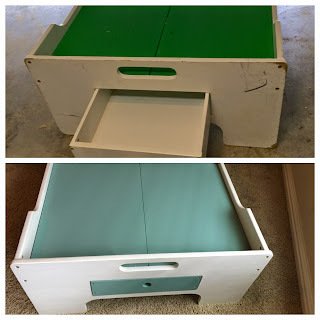 The next morning, I used the rustoleum spray paint clear coat on all the outside/front pieces of the table and on top with the teal chalk paint. I let that wire out/dry overnight in the garage. 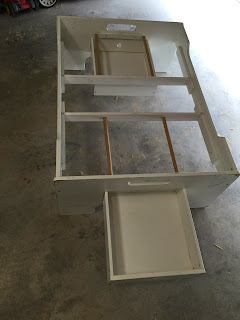 This project cost me only the table since I had everything else at home but if you needed to buy paint I still think the cost would be minimal and worth the effort. The next morning, I reassembled it upstairs in their playroom. I put all their duplo legos in one drawer and their thomas the train stuff in the other drawer. They were so excited to see their new train table that they set up their train set right away!